As your local Crawl Space experts, AdvantaClean of New Bern and the Crystal Coats sees, first hand, the many issues dirt-floored Crawl Spaces pose for home and business owners in Eastern N.C. The exposed earthen floor allows ground water to be evaporated inside, increasing moisture levels in the Crawl Space area. Along with high moisture levels, warm and cool air comes in through the ventilation system, producing condensation and high humidity levels. Your Crawl Space can be directly affected by factors like improper grading and lack of gutters or downspouts at your property, leading to accumulation of water inside. The issues that can stem from Crawl Space Moisture are plentiful. Approximately 40% of the air in your Crawl Space seeps into your home or business, effecting the air quality of your entire property. If mold has begun to grow in your Crawl Space, mycotoxins from the growth can seep into your home, as well. Poor indoor air quality can then lead to low energy efficiency, and more importantly, health issues. 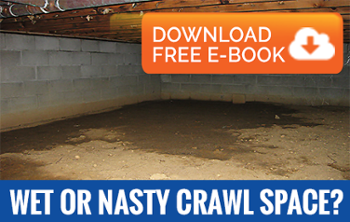 If your Crawl Space has a moisture or mold issue, so does the rest of your property. Alternatively, mold growth leads to rot and costly damage repairs. Our goal at AdvantaClean of New Bern and the Crystal Coast is to remediate any existing moisture damage, and ultimately, intercept any threatening moisture issues before they start. You can rest assured that our knowledgeable and experienced team at AdvantaClean of New Bern and the Crystal Coast will remediate and restore, not only your Crawl Space, but your entire property to the most Clean, Healthy, Safe, and Energy Efficient place it can be. Give us a call 24/7, and we’ll send out one of our experts for a free inspection and estimate!